I will be out of town from March 13th 2009-March 28th 2009. There will be no yoga classes at A.K.F. during those 2 weeks. We will have our regular Sunday class on the 29th. I will see you then. This Will be a fun event for Children and their families! 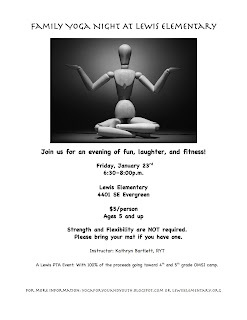 It is a fundraiser for Lewis Elementary and this class will be very family friendly with poses for all abilities. I will be incorporating games, stories, and laughter to keep children and their families fully engaged in the process of yoga. If you are new to yoga and you need some tips, see the information below. Family yoga will be in the cafeteria at Lewis Elementary 4401 SE Evergreen St. Portland, OR 97206. Class is scheduled to begin at 6:30, so come a few minutes early to check in, pay your fee, and get set up. I will have some yoga mats for people to use. Please bring a mat if you have one. I know that children will need to eat before class, but try to leave some space between dinner and class, also a big cheese burger and fries right before class is probably not a good idea, keep it light. Wear comfortable clothing that will move with you. Skirts, dresses, or jeans are not really appropriate for class. Bring a water bottle if you think you need one. There are drinking fountains at the school. As always, if you feel a posture or movement is inappropriate for you body, please feel free to sit out for that movement or try something else. I want everyone to come out happy and feeling great. This class is appropriate for children who can follow directions. I put age 5 on the sheet, but if you have a child who is a little younger that can handle coming to class, please feel free to bring them. Please do not bring children younger than 3. Children under 3 can learn yoga, but they have very different needs from older children. Laughter yoga, is it the best medicine for stress? Recently, I received a request from one of my students for laughter yoga. My first feeling was discomfort at this request, and my initial reaction was to try to find excuses why I shouldn't teach it in class, especially in a corporate setting. I am grateful for this student's persistence in requesting laughter yoga. Because I had told my students that I was open to suggestions and requests, I figured I had better follow through. I went on-line to find out about laughter yoga. I realized that to learn more, a DVD purchase was in order. I watched it at home, alone. Uncertainty was the pervasive feeling after viewing the video. 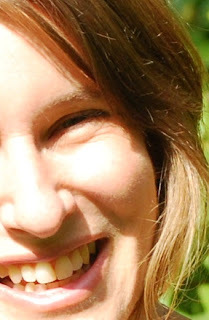 The idea of leading laughter yoga was way out of my comfort zone. I am not a good fake laugher and I don't have a good boisterous laugh either. I wasn't sure that I could pull this off. As I watched the DVD that showed groups of people doing the exercise and obviously enjoying it, I couldn't help but smile. My brain was still convinced that these people on the video were surely faking it for the camera. Dr. Madan Kataria who founded laughter yoga international and taught the exercises on the DVD says that laughter yoga is not someone standing around telling jokes, but a set of exercises that works the cardiovascular system and the deep abdominal muscles. If you ever get a chance to see one of his videos, he has the most amazing spontaneous laugh. I pictured myself teaching the exercises, certain that I would feel absolutely ridiculous. I was worried that I would make my students feel ridiculous as well. I saved the laughter yoga for the last session in our 12 week series. I figured that if it was a wash and they banished me from working there that at least I finished the 12 week series. Before my corporate class, I taught another regular class at AKF. I was able to share a bit about my discomfort for this new endeavor with my students and also demonstrate some of the exercises. To my surprise, it completely lightened the mood of the class and created a connection for the students and an element of pure fun. As I was introducing the exercises of laughter yoga at the corporate class, I let my students know that this is not meant for entertainment and then joked that they may be entertained by my efforts. At first students flashed me a look of "you are kidding right?". But everyone was game and participated. Not only did they participate, but with a sense of vigor that I had not seen in any of our other sessions together. What struck me most, as I observed the class and people's reactions during laughter yoga, was that we looked just like the people video. The expressions on our faces and twinkle in our eyes, it was the same. Perhaps the people on the DVD were not faking it for the camera after all. When I left the class, I experienced a sense of calm and joy that I hadn't felt after teaching other classes. It turned out that the request for laughter yoga was the best gift I have received in a long time. After my first encounter, I have had the courage to share laughter yoga with other students. I am always surprised by people's willingness to relax and join in. I have been very surprised by the gratitude people express after laughter yoga. Perhaps laughter really is the best medicine. I was once asked by a student to write about why chanting is part of my yoga practice. I first learned chants at the yoga studio where I did my training (Amrita). I didn't know the words or the melody. I felt self-conscious and a bit uncomfortable, but at the same time I enjoyed the symphony of voices in the room. Over time, I relaxed and fully participated in the chants. I often sing in the car along with the radio without knowing all of the words. I had a job with a long commute for a while, so that added up to a lot of singing time. I catch a few words and then mostly enjoy just making the sounds of the notes with my own words or no words at all, following the melody and then singing the chorus really loud. It takes me a long time to learn the words to any song and there are few that I know by heart. I also sing at home. I've found that my children listen better to a request when it is sung and it's really hard to get into a bitter argument if you sing your complaint in a silly way. I like to follow a melody that pops into my head and see where it goes. Sometimes it's just a few notes over and over, other times it's more. Often I drive my kids nuts. Mostly, I don't care, it's better than shouting, at least in my mind. I have to admit that it took me a long time to learn the words to the chant we are practicing in class. Due to my persistent nature, I decided that I would learn the words by heart. I checked out Richard Freeman's chanting CD and listened to it one day over and over, singing along. I think I was putting up plastic to help insulate the old windows in my house. So each time the chant ended, I hit play again. Eventually it stuck. I had my classes practice chanting when I taught out of my house, back then I felt brave. I knew my students well and I felt comfortable with them. When I moved out of my house and into the Academy of Kung Fu, I let chanting fall away for a while. I certainly didn't feel brave and there was a lot to do and learn this last year. I have, however continued chanting to my 24hour fitness students. I began chanting as a way to get students calmed down for and during savasana. Classes there are packed and there is little comfort in the rooms provided. You can almost always hear booming music outside of the room and then there were all of the restless bodies in the room. I remember the first time I sang. I was terrified and I hoped that I would come out on key, as I was singing a cappella. I continue to use chanting when needed and now again, I feel brave. Students in my 24hour classes and my intermediate students at AKF will be invited to sing with me. I think that I still haven't answered the student's question. I chant because I enjoy hearing the sound of my own voice. Not in the fluffy, superstar way, but I enjoy that it comes from a very deep place, from places as distant as the toes and the deep low belly. It is not about the ego, but about feeling freedom in that small place that connects my head to my heart. Below, you will find the words and translation to the chant we will be practicing in class. This is in case you want to practice at home or you are wondering what the heck we are singing. If you want to listen to the chant, you can find it on Richard Freeman's CD on chanting. This week I chose a quote from Thomas Merton's book, Seeds. Thomas Merton' was a Trappist Monk, political activist, social visionary, and literary figure. I have not read his entire book, but find myself reading it in bits and pieces. The following quote begins on page 107. This is a challenge for me, not worrying about what I am missing and with grace "to pass from one imperfect activity to another". It is relevant to our work class because we are exploring balance poses that often feel different from moment to moment, day to day. It is the act of paying attention, making our best efforts, and then moving on that helps deepen our practice. Downward facing dog is one of my all-time favorite poses. For me, it is a restful pose, full of intricate possibilities. It's a pose that I can explore in. I can test out my hamstrings, arm strength, the tone of my belly, and be as engaged or relaxed as I chose. It's a pose that I love to linger in during my own practice and I often stay for a several breaths before moving into another posture. I experience it as a very fluid pose even though both hands and feet are grounded. As a teacher, I get the most questions about downward facing dog. I hear complaints of wrists hurting, shoulders hurting, or hips feeling stuck. I make the most suggestions for adjustments in this pose, as sometimes a small change can make a huge difference. Below, you will see me in the downward facing dog. The first picture, I am out of balance. The extension of the pose and my weight stops at my wrists. This is often a cause of wrist pain in the pose. The second picture is downward facing dog practiced with balance between arms and legs. Each picture will includes comments below to help you find the most balance and ease in your practice of downward facing dog. This was my first attempt at modeling poses. It was also Monica Nettle's (friend and photographer extraordinaire) first attempt at photographing yoga poses. I think she did a great job, we were both nervous about the process and the end result. I am very thankful for Monica's help on this project. Notice that my stride here is short and my shoulders are almost directly over my hands. My back is rounded and in general, there is little ease in my posture here. There are other imbalances that are not shown in this picture. One when one's head hangs like a bowling ball. In the beginning, I remember having bowling ball head. Another is hammock armpits. That is when one presses the armpits strongly toward the floor in an attempt to get more stretch. Interestingly enough, it just stresses the shoulders and there is little actual stretch or length in the upper back. Another is not having all 10 fingers rooting into the floor. There is amazing potential in just engaging and pressing down through all of the first and second knuckles of each finger. In this picture you might notice that I have more space between my hands and feet. This allows room for the pose to open up. I have all ten fingers strongly rooted. My hands are as wide as my shoulders and there is a bit of a lift along the front of my body from my arm pits to my low belly. This support on the underside of the pose takes the pressure off of wrists and shoulders. My feet are hip-width apart and my heels slightly lifted. If you notice the position of my head, it is neither lifted, nor hanging. I often try to create the feeling of headstand with my head and neck in downward facing dog. This small effort really lights up the pose. If your hips are tight and you have trouble creating a clean line from hands to hips, try bending your knees until you can feel your belly engage, your sit bones lift and broaden and your weight shift away from your hands. I hope this little tidbit is helpful. I will be happy to answer any questions you might have, just send them to me via email. I will be featuring poses regularly in my blog. I'm grateful for my family, friends, and the opportunities and challenges that life brings my way. I feel lucky to have wonderful children and a loving husband. I am grateful for what I have learned from my yoga teachers and the students who come into class every week. I am thankful for my good friend Betty who is there through thick and thin.